The following exercises and content were created by our friends at Engage Health, exclusively for iHealthSphere. 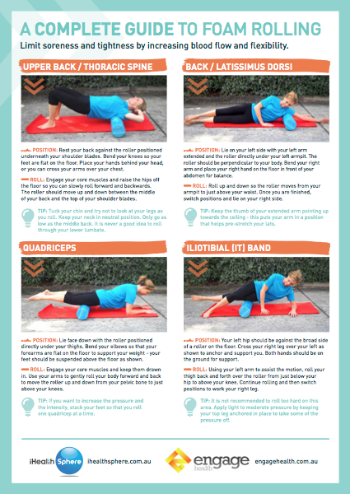 Read on to discover why foam rolling should be an integral part of your routine and how to download our handy foam roller exercise worksheet. A foam roller is a cylindrical object which is used for massage therapy or as an exercise aid, usually in pilates, yoga or core training. Foam rollers can be either smooth or have ridges on the outside. The ridged version is best for trigger point massage, the smooth alternative is great for all uses. The foam roller is great for lengthening and e longating muscles and it is particularly beneficial for office workers, athletes, or those who suffer from tight and fatigued muscles. Foam rolling is also called myofascial release (MFR) and is designed to release the “knots” in your muscles. You might experience knots in your muscles after exercise, as the result of injury or after a period limited muscle use. Foam rolling is an effective method of releasing these knots and reducing discomfort. The deep compression of self-myofascial release allows normal blood flow to return and the restoration of healthy tissue. A foam roller allows for this release, much like a remedial massage from a therapist, but without the associated cost. When used frequently and often the foam roller can greatly assist with correcting muscle imbalances, improving range of motion, preventing injuries and enhancing recovery. Foam rollers can be used pre-workout, pre-stretching, or simply to start the day. Roll slowly. When you find areas that are tight or painful, pause for several seconds and relax as much as possible. You should slowly start to feel the muscle releasing, and after 10-30 seconds the discomfort or pain should lessen. It only takes 10-15 minutes a day to notice benefits. So get yourself a foam roller and get ready to roll! The following exercises have been devised to ensure that you get the most out of your foam roller. Follow the instructions carefully so that you get the full intended benefits of your rolling sessions. We have split the exercises into three areas: back, legs and glutes / hips. We've also created a downloadable exercise sheet below so that you have a portable guide to print, share and take with you to the gym or to use at home!